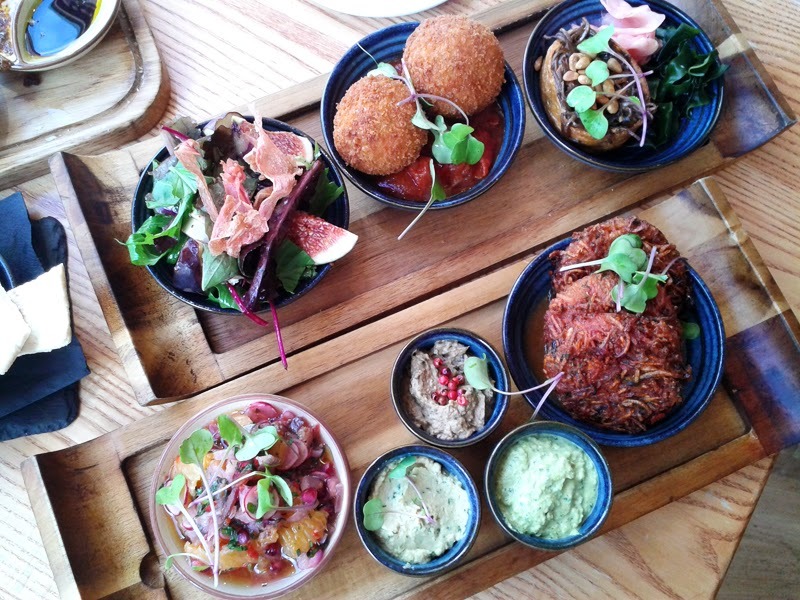 I've noticed that small plates, tapas and sharing platters are becoming increasingly popular offering in restaurants, particularly for lunch. Have we got a more communal attitude to food or are we greedier? Who knows, but I like the format. Sharing food with family and friends around the table is pretty much my number one hobby. 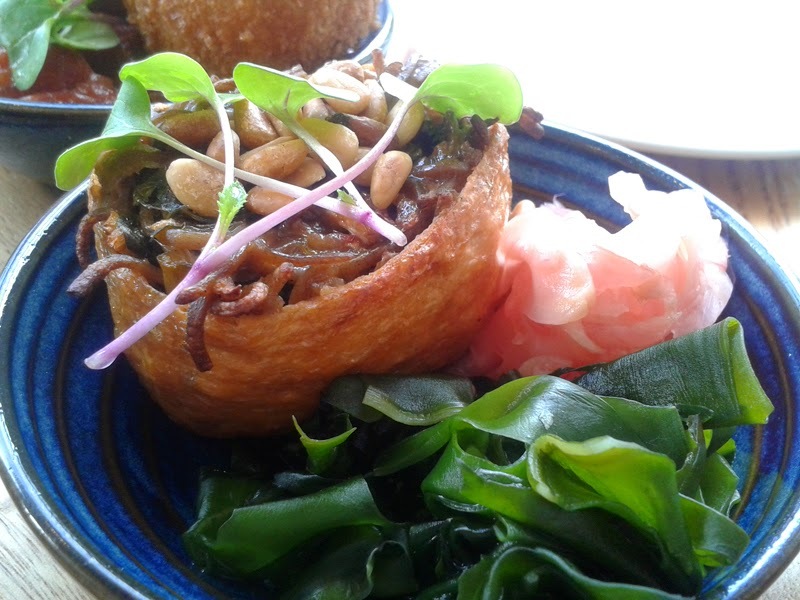 The latest Brighton restaurant to get on board with this trend is, quite fittingly, the vegetarian Food For Friends, a place who seemingly breeds decent chefs and keep quietly innovating; twisting and tweaking but keeping to their style of food with a heavy Asian twist. 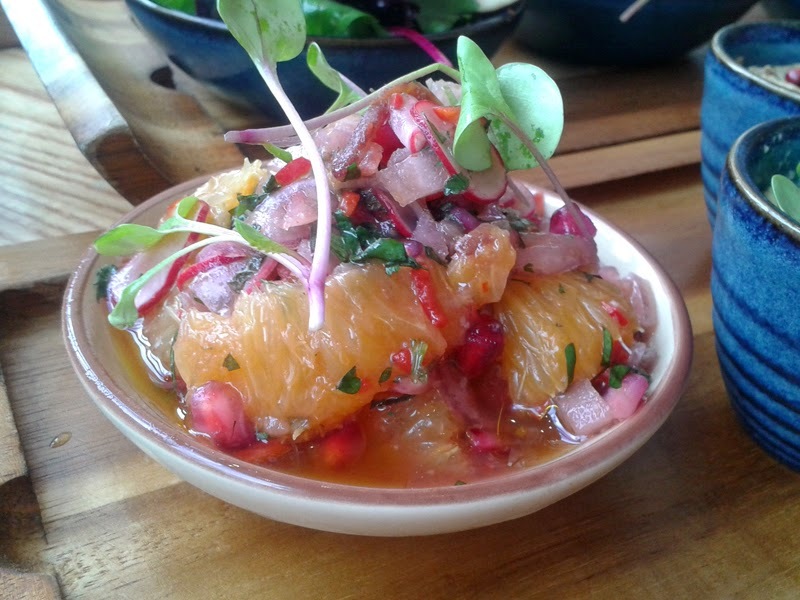 Their new mezze sharing menu is 15 items long, with dahl, salads, dips and vegetarian dishes. You can share the recommended three plates between two as a starter or opt for three each as a meal in itself (£4.50 each or 3 for £12). I chose three dishes then let the restaurant dictate the rest, I like to fly by the seat of my pants. Overall this pick n' mix style is a really ideal lunch choice. Presentation is their forté here so visually it scores a lot of points if you wanted to treat a friend or your darling mother (not my Italian mamma -she despises eating out). When the dishes are brought to the table they certainly get the wow factor. I appreciated the super crisp coating of the arancini. Quite often in restaurants they are made ahead and get a bit soft. There was also a subtle, sweet coconut flavour to the rice which turned out to be the coconut milk used in the risotto base for the arancini. Clever and a good twist to a Southern Italian classic. 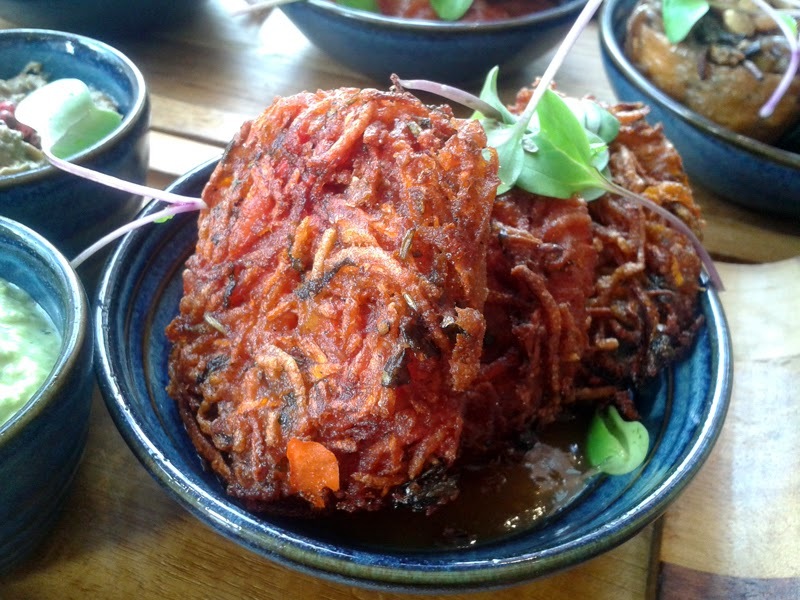 The favourite dish was probably the Beets, Potato and Parsnip Spiced Rosti. Crisp and super fine, the sweet, sticky tamarind and date sauce was a good partner to the earthy root vegetables. Dips were fabulous and a good filler with bread for a lunch style like this. All of them were delicious and different, prettily served in small glazed ceramic pots. There was a punchy pink peppercorn Baba Ganoush, a refreshing Pea and Mint Hummus and a Lemon Coriander Hummus. 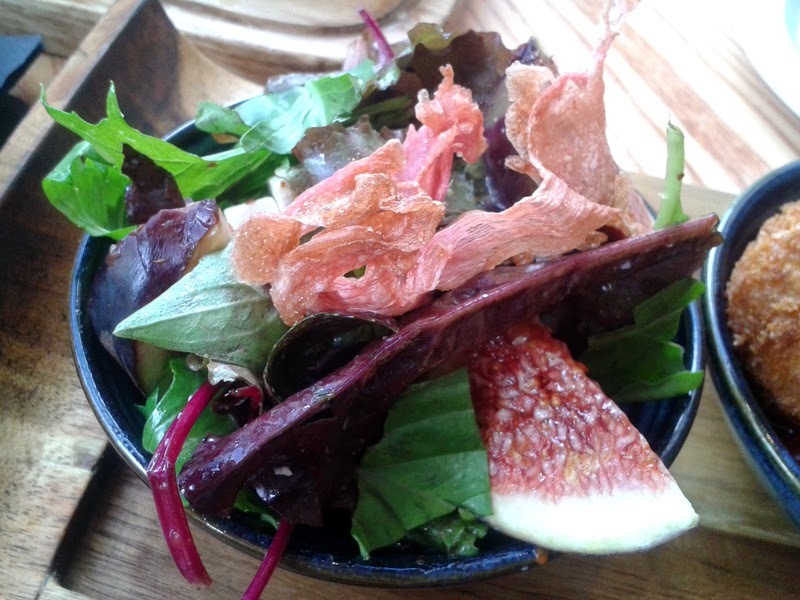 The pickled ginger crisps made for a very, very unusual addition to the Fresh Fig and Smoked Ricotta Salad. The mellow Mediterranean flavours that typically work well together (although the ricotta was overly smoked for me) were too much of a contrast to sharp Asian twist on this. The sweetness of the honey dressing with the smoked ricotta was another strange combination too. Just a flavour too far here. Much more balanced was the Orange, Radish and Red Onion Salad with a fennel seed and lemon dressing. This was very fresh flavoured and nicely melded so the sharpness of the red onion had time to soften and sweeten in the juices. You know my feelings on tofu, but I like to be challenged by food (and this was one of FFF's choice) so tried the Sweet tofu pocket, essentially a thin tofu wrap containing fine soba noodles with crunchy toasted pine nuts in a slightly creamy, sweet sauce. Yeah, it was a good one add to the overall selection for variety but I remain firmly in the Tofu Meh camp, as it only formed a small part of this dish. So yes, I thoroughly enjoyed the lunch here and always good to try new foods and flavours. The space is somewhere I still really like. One of the lightest, brightest restaurant interiors that is the best seat in the house for all that people watching. As I've said before, FFF is a very nicely located restaurant, tastefully decorated. It's grown up with no gimmicks, something that in the landscape of trend dining I'm appreciating more and more. That, or I'm getting on a bit now. I was invited to review Food For Friends.